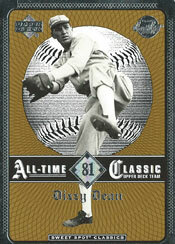 In 1933, during his second full season in the big leagues, Dizzy Dean of the Cardinals was developing a reputation as a fearless pitcher who could work his way out of any situation. That cool under pressure would help him survive a tough jam off the field as well. Dean walked into a St. Louis drugstore while an armed robbery was in progress. One of the robbers stuck a pistol in Dean’s side and ordered the pitcher to keep quiet. Dean and the customers survived the holdup unscathed. The incident added to the legend of a 23-year-old pitcher who was attracting as much attention for his demeanor as he was for his arm. “What’cha doin?” he asked the two jittery stickup men. “Well, I’m Dizz…” he said, his friendly introduction interrupted when they waved their pistols. Dean and the others stayed in the back room of the drugstore until the robbers fled. Dean’s presence in the incident was reported in newspapers the next day. That evening, according to Heidenry, Dean got a phone call from a man who said he was one of the robbers. A few days later, a half-dozen neckties, wrapped as a gift, arrived for Dean.